The Joint School of Nanoscience & Nanoengineering (JSNN) within the Gateway University Research Park in Greensboro is a new 105,000 square foot interdisciplinary research facility dedicated to academic and industrial research. This $64 million project includes extensive labs, visualization suites and conventional science and engineering facilities. 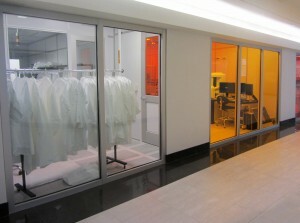 One of JSNN’s main features is a state-of-the-art nanobioelectronics clean room. 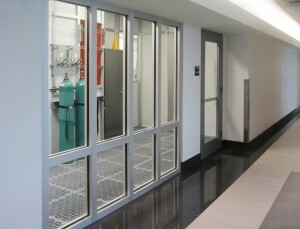 Project architects wanted to maintain an open, transparent lab design. But, because the clean room has potentially explosive materials, it must also contain flames, heat and smoke in the event of a fire. So, HDR chose to use fire rated glass and frames on the perimeter of the clean room. SAFTI FIRST provided SuperLite II-XL 60 in GPX Frames for the 60 minute walls. SuperLite II-XL is tested to ASTM E-119/NFPA 251/UL 263, effectively containing flames, heat and smoke inside room and preventing it from spreading to other rooms or into the corridor. This enables building occupants to safely exit through the corridors. Having transparent, fire rated walls also helps first responders see inside the room and visually assess the situation. Since the rating of the frame must match the rating of the glass, GPX Framing also tested to ASTM E-119/NFPA 251/UL 263 was used for the wall. Supplied with a clear anodized finish, the GPX Framing system matches the same hard-edged sightlines of extruded aluminum used in the non-rated systems. Architects also favor the GPX Framing system for its clean appearance and uniform sightlines without any unsightly exposed fasteners. Used together, the SuperLite II-XL and GPX Framing system combines seamless and elegant wall-to-wall and floor-to-ceiling transparency and built-in maximum fire protection that works 24 hours a day, 7 days a week without relying on any mechanical or outside triggers. In addition to meeting the design intent and the code requirements, the SuperLite II-XL 60 and GPX Framing system also provides noise abatement benefits with its high STC ratings and helps reduce energy costs by maximizing shared artificial lighting between spaces.